It’s rare to have a football game where there are more injuries than points scored by the home team. 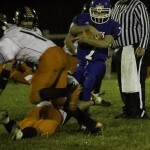 That’s exactly what happened on Friday, Sept. 23 in St. Ignatius when the Mission Bulldogs played the Florence Falcons. The Bulldogs lost 46-8, but judging from the crowd’s reaction, you wouldn’t be able to tell. Although the stands were a little empty by 7:30 when Rose Bear Don’t Walk sang the national anthem, by the time the game got over by 10:30, the bleachers were full, and a crowd lined the fence separating the dirt track from the football field. For the first time in Mission High School history, both St. Ignatius ambulances were used that night. The first injury was #64 for Florence, Keenan Hendrickson, who took a knee to helmet, followed shortly by #10 for Mission, Dylan Evans. Evans, according to athletic director Alan Pule, dislocated his fibula. The majority of the spectators stayed until the end, watching Mission lose gracefully to the Falcons. Some, like high school sweethearts Max and Marianne Johnson used to attend Mission High themselves, and have been married for 57 years. 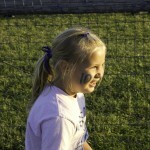 They now enjoy the games from the comfort of their minivan, rather than playing football and cheering on her boyfriend. Football, to the town of St. Ignatius, is more about supporting the community than watching a rough-and-tumble game. 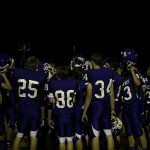 The Dawgs, whose year end record was 3-5-0, are by no means a great team, but they get a small community together. Most spectators aren’t actually watching the game, which they will readily admit, but relish the opportunity to get together with family and friends. 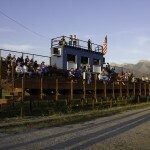 Spectators wait in the Mission bleachers for the game to start on Sept. 23. 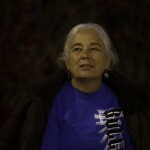 Virginia Dally, 56, talks with spectators at the Bulldogs game on Sept. 23. Dally has now been a ticket-taker for three games, and is a substitute teacher in the St. Ignatius school district for grades K-12. 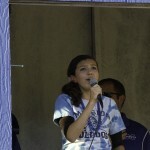 Rose Bear Don’t Walk sings the national anthem before the start of the Bulldogs game. An girl (name withheld) shows her support for the Mission Bulldogs, and number 10, Dylan Evans. 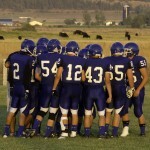 The Mission Bulldogs huddle before the start of the game against the Florence Falcons, Sept. 23. 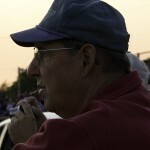 Pete Von Holtum, 58, stands at the fence watching the game Friday evening. 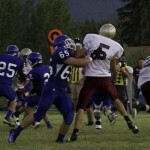 Barret Sargent, number 65, blocks for the Bulldogs against the Falcons. Annie Morigeau, 25, holds her 7-month-old son Isaac. Morigeau makes and sells clothes at the games, like the hat her son is wearing. 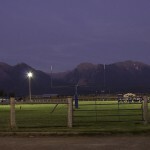 The stadium lights at the Mission High School field begin to turn on on Friday, Sept. 23. 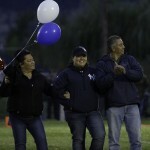 Janeal McDonald, 18, is escorted by her parents at the Mission Bulldogs Senior Night on October 21. McDonald has been the manager of the Dawgs football team for three years, and also managed basketball and volleyball. 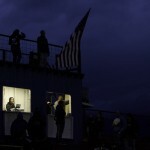 Spectators respect the flag during the national anthem on Oct. 21. 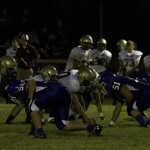 The Mission Bulldogs face off against the Florence Falcons on Friday, Sept. 23. Marianne Johnson watches the Mission Bulldogs play the Florence Falcons on Sept. 23. Janay Wunderlich, foreground, and Christine Robinson, both 15, watch the Mission Bulldogs play the Florence Falcons on Friday, Sept. 23. Leta Wicka, 64, watches her grandson Barret Sargent (#65) play against the Loyola Rams. 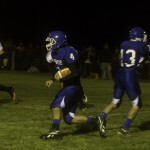 Austin Durglo, a senior running back for the Dawgs, runs for yards against the Ronan Chiefs. 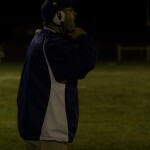 Head coach Rich Ferris, also the principal of Mission High, yells a play to junior quarterback Dylan Evans Friday night. 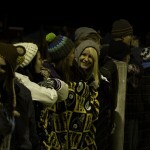 Mission High students line the fence in the cold on Oct. 21 to watch the Dawgs play the Ronan Chiefs.